I am a late bloomer when it comes to Ledisi. I only started following her since the release of Lost And Found. That’s when I really started to get into everything else in her catalogue. Ledisi has a way of getting your attention with those vocals and rightfully so. I saw her live last year for the first time, during Summerstage and what a performance. Her sunny disposition, interaction with the audience and church-like harmonies are enough for you to get swept up and taken away on her magic carpet ride. Her recent release Turn Me Loose garnered Ledisi 2 Grammy nods this year, one for Best R&B Album and the other for Best R&B Female Vocal Performance. Her decision to tackle change head-on, was the right one. It brought a whole new side to Ledisi that we were not exposed to previously. Obviously, we all embraced it with open arms. This Sunday at B.B. 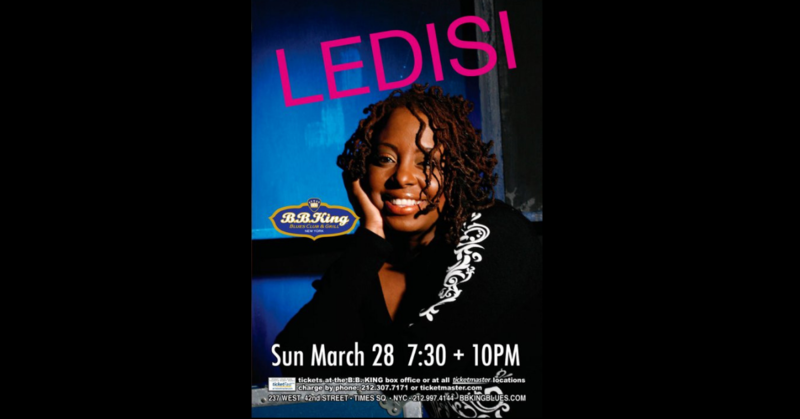 King Blues Club, Ledisi will be throwing it down in two shows (the 7:30 PM show is already sold out), leaving her indelible mark on New York City once again.